What's the big deal about these snake genomes anyway? One year ago today, the first snake genomes ever sequenced hit the newsstands. OK, so two papers in Proceedings of the National Academy of Sciences isn't exactly the cover of Time magazine to most people, but it was big enough news that it was covered by The Huffington Post and the two most prominent interdisciplinary scientific journals, Science and Nature, the former devoting a special section to the event. One year later, dear reader, welcome to the Life is Short, but Snakes are Long coverage of the snake genome project. So just what is the big deal about these snake genomes anyway, and what's changed in snake biology in the year that they've been available? 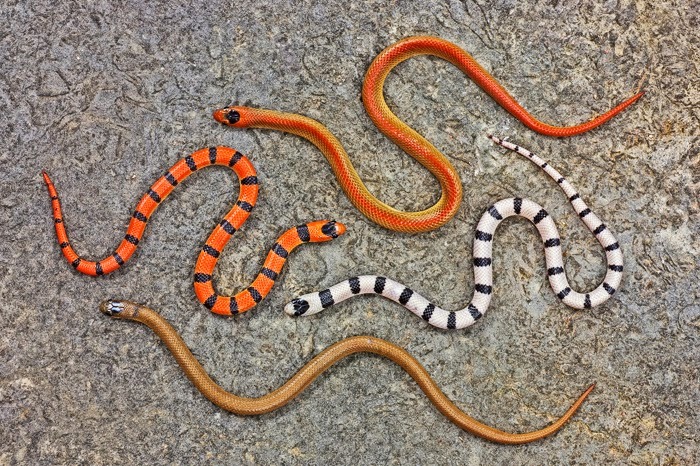 In one way, sequencing a snake genome means that snakes finally join the illustrious ranks of lab animals like the mouse, rat, guinea pig, fruit fly, and amoeba, all of whom have already had their genomes sequenced. By now the genomes of several hundred species have been sequenced, starting with a virus in the 1970s, and the first archaeon, bacterium, and eukaryote within one year of one another in 1995-96. The first animal genome sequenced was that of the model nematode Caenorhabditis elegans in 1998, and the first vertebrate was a pufferfish, so chosen because its genome is so small, in 2002 (although an incomplete first draft of the human genome preceded that by a year). As of 2014, we're now up to just over 100 vertebrate species, about 60 of which have been annotated and formally published, as well as numerous other animals, plants, fungi, protists, and prokaryotes. 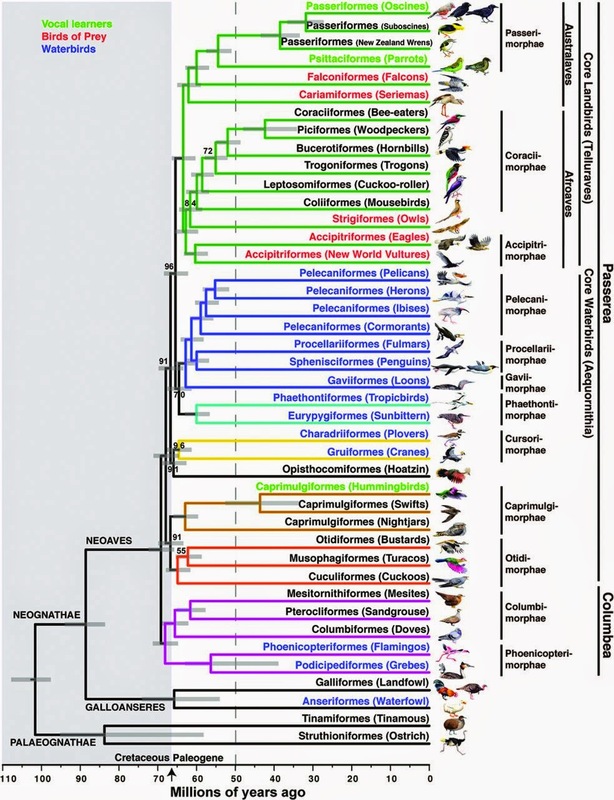 Last week, Science highlighted drafts of 38 new bird and 3 new crocodilian genomes, the largest single release of vertebrate genomes to date. But we are still a long way from sequencing the genomes of all known species. Why have we chosen the species we have? What does it mean to sequence a genome, exactly, and why do we do it? consists of. Exons are coding DNA. We use the word genome to refer to all the DNA within a single organism. Confusingly, this is not quite the same thing as saying all the genes in an organism, because we usually only call sections of DNA "genes" if we know what they do. You've probably heard that 98% of the human genome is "junk", or non-coding, DNA, which is just another way of saying that we haven't figured out what it does yet. Actually, we now know lots of things that non-coding DNA is good for, but we still usually don't call most of that DNA "genes" because we use that word specifically to mean sections of DNA that are read out via RNA and translated (usually) into proteins, which then have obvious effects on cells and the body. Non-coding DNA can also have effects on the body, often by regulating other genes, but it works in a more complicated way that we don't yet fully understand, so we tend make over-generalizations about it or dismiss it as unimportant. a tree like this for squamate reptiles. When we say we have sequenced the genome of an organism, we mean that we have read the sequences of all of its DNA, every one of its genes and all of its non-coding DNA, even if we don't know what it all does. The -ome suffix is added to the word 'gene' to signify "all". Yogis will be familiar with the Sanskrit word Om, which means "the whole thing", something that encompasses the entire universe in its unlimitnedness. Other fields in biology that consider all constituents of something collectively have picked up on this neologism, so we have proteomics (the study of all the proteins in a particular organism), transcriptomics (the study of all the RNA), and so on. Genomes are huge1, and we've strategically chosen species to sequence that are scattered across the diversity of life so that we can construct a skeletal tree of life based on genomic data. We have high confidence in such a tree2 because whole genomes contain so much data that trees built from them are more likely to reflect true evolutionary relationships than trees built from just one or a few genes. So we've selected exemplars from each major group of organisms to start out with (e.g., one sea urchin, one sea squirt, one lamprey), and eventually we'll go back and fill in the gaps. By sequencing the King Cobra (Ophiophagus hannah) and Burmese Python (Python bivittatus) genomes first, we're setting these species up to become model organisms, exemplars, and in some ways stand-ins for all of snake diversity in many future studies. When we sequence a genome we read all the DNA from a single individual3. This is different from knowing all the possible variants (often called alleles) of those genes. It's often said that a person has "the genes for" something, when in reality all people have the same genes, with different alleles. For example, if the person whose genome was sequenced in the Human Genome Project had brown eyes, we'll just have the gene sequences for brown eyes, not for blue or green. In order to get an idea of all the possible variants of all the genes in a species, we'll need to sequence the genomes of many individuals. Some genes, such as those involved in the immune system, have over 1,500 alleles (the "gene pool"), no more than two of which occur within the genome of a single individual (one from the mother and one from the father). So understanding the entire gene pool of a species is a very daunting task, given that we only have whole genomes for a few hundred species (one individual each), with multiple individuals of a few species, including humans.4 Population genomics is an emerging field, yet to be applied to snakes in any form, although apparently a few projects are in the works. Snake genomes are about half the size of the human genome (although an organism's complexity is not directly proportional to its genome size; for example, some salamander genomes are more than 60 times larger than the human genome). 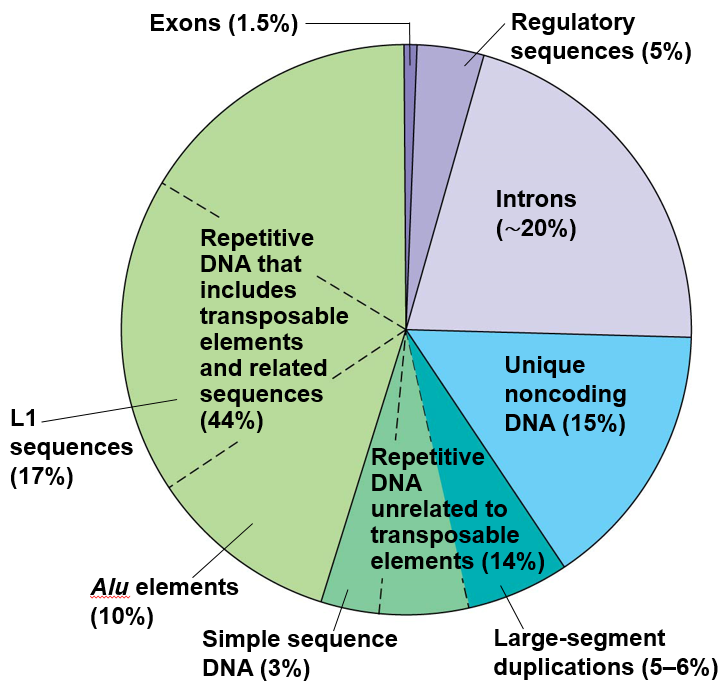 The proportion of repetitive elements (the most common form of "junk DNA") in snake genomes is about the same as that in humans (~60%). evidenced by their larger accumulation of neutral substitutions. And colubroid snakes have rates even faster than that of snakes at large. 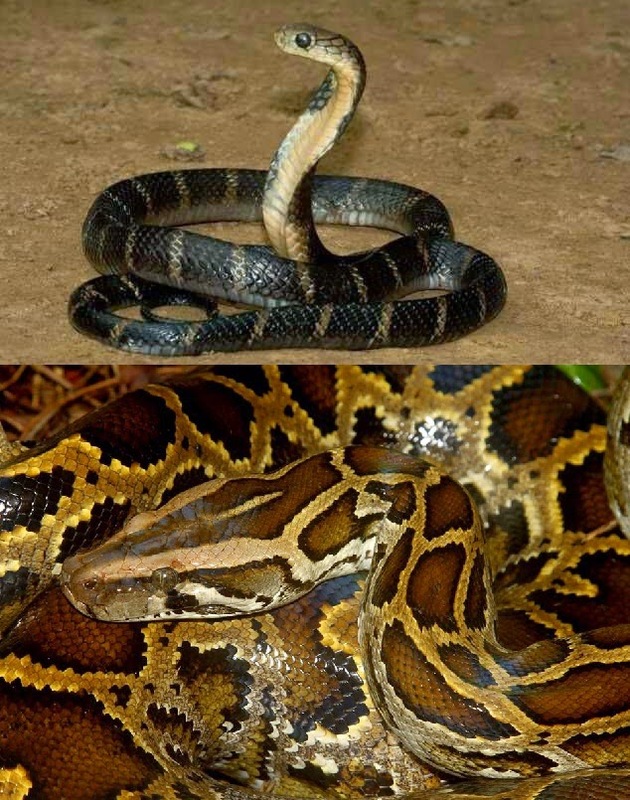 Adaptive evolution (as evidenced by functional, non-neutral, changes to genes) in snakes has happened to over 500 genes, especially those involved in the development of the limbs, spine, skull, and eye, and those regulating the function of the cardiovascular system, lipid and protein metabolism, and cell birth and death. We already knew that all of these systems in snakes were highly modified relative to other vertebrates, and now we know that the genes that underlie them are too. Some groups of genes have grown or shrank in snakes - for example, snakes have a lot more genes coding for vomeronasal receptors, and a lot fewer genes coding for opsins, which are light-sensitive proteins in the eye. This makes sense given what we know about snake sensory systems. Changes to gene expression that happen after a snake feeds involve thousands of genes that control rapid changes in organ size—but genes that control cell division change in the kidney, liver, and spleen, organs that grow by cell division, but not in the heart, which grows when individual existing cells get larger. 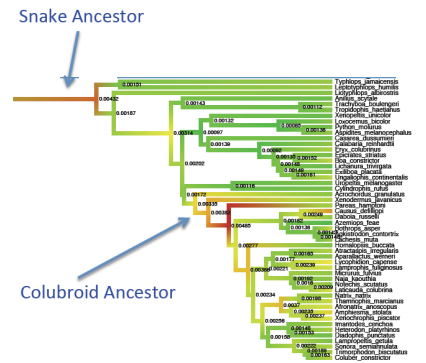 Snake genomes contain endogenous viral elements from three families of viruses that have recurrently infiltrated their DNA over the past 50 million years. This is actually not rare, although it is bizarre and awesome that the 'fossils' of these ancient viral genomes can be identified in their host genomes even after tens of millions of years, and it can help us better understand both the biology of viruses and that of their snake hosts, including how viruses have contributed functions to the genetic repertoires of their hosts. It's not yet clear to what extent the evolution of these novel toxic venom proteins corresponded with a shift to higher levels of their expression in the venom gland and lower levels of expression elsewhere. Although it seems obvious that their expression in non-venom-gland tissues would be harmful, their non-toxic orthologs are expressed in tissues as diverse as the kidney and brain in pythons, and no one has yet measured their expression outside of the venom gland in venomous snakes. Alternatively, gene duplication might have taken place after the change in function, if the genes in question were alternatively spliced to produce both toxic and non-toxic proteins from the same gene. 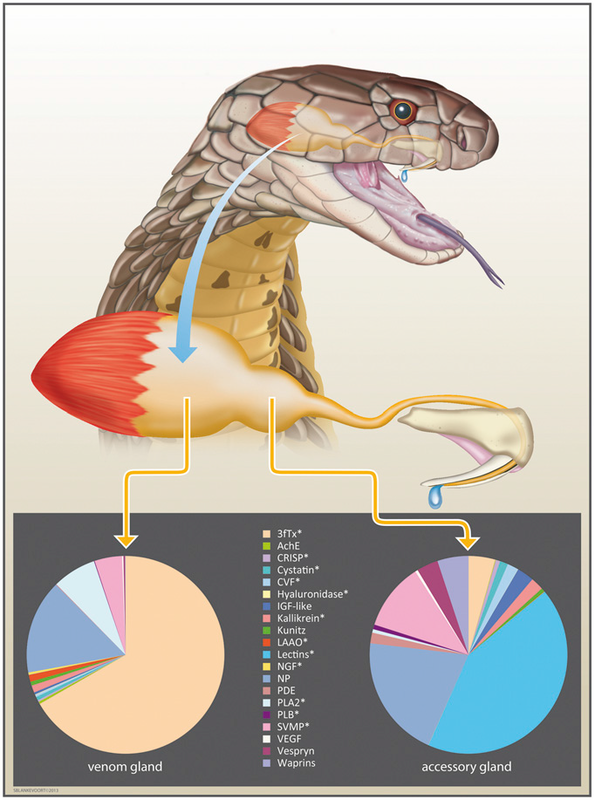 Evolution of siRNA and other regulatory elements (which is hard to detect because there's still a lot we don't understand about how it works) could then restrict expression of a particular splice variant to the venom gland, which could explain why we're seeing evidence that the venom protein genes themselves are often still expressed in other tissues even though they are capable of coding for highly toxic proteins that must be maintained in the venom gland in a competent but inactive state. The cobra genome by itself does not answer these questions, even with help from that of the python. In order to fully understand the evolution of snake venoms (with major implications for public health, particularly in developing countries, not to mention the potential of venoms to be used as drugs), we'll need genomic, transcriptomic, and proteomic data from numerous snake species. As you can probably see if you know your snake taxonomy, these species represent a scattering of well-known snakes from each of the major branches of the snake tree. They have been strategically chosen to enable snake biologists to use them to put together a well-supported skeleton of the snake tree of life. However, several branches (such as the dwarf pipesnakes, acrochordids, and lamprophiids) are still missing.7 In particular, an atractaspidid genome would be useful in building a better understanding of the role of convergence in snake venom evolution - resolving the debate between proponents of a single ancient origin for venom and those of several more recent, independent origins. Genomes of scolecophidian blindsnakes and toxicoferan lizards such as Gila monsters will also help resolve this question. Hopefully, these genomes and others will continue to illuminate evolutionary biology for us in ways Darwin could have scarcely imagined. Thanks to JD Willson, Baloch Imrankhan, and Alison Davis Rabosky for the use of their photographs, and to Alison Davis Rabosky and Todd Castoe for providing me with information regarding genomics.